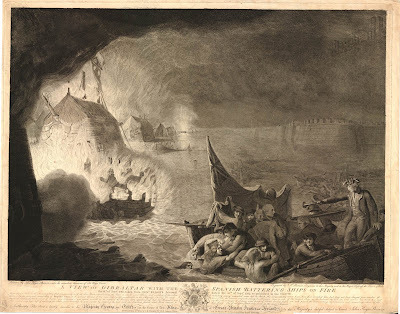 A View of Gibraltar with the Spanish Battering Ships on Fire, engraved by J.K. Kerwin and published by J.K. Kerwin and William Hinton, 1784, British Museum. Late in the Great Siege of Gibraltar, the longest siege ever endured by British forces, the Spanish and French decided on a massive push to overwhelm British defences and seize the rock. The Grand Assault, as it would come to be known, involved tens of thousands of sailors and soldiers tackling the British fortifications and ships in an all out blitz. Ten Spanish floating batteries formed the backbone of the attack with well over a hundred heavy guns trained on a British position that had already endured years of bombardment. The British replied with hot shot and fireships, setting the batteries alight. In total, three of the ten exploded, and the other seven so damaged that they were scuttled. Casulaties were heavy among the Spanish gunners. Roger Curtis, a Royal Navy officer, led small boats to do battle with the Spanish and French during the assault, but this combat operation quickly transformed into a humanitarian mission. 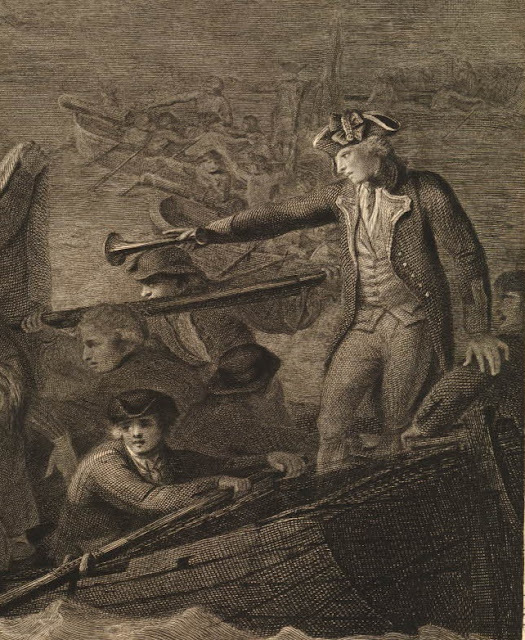 Despite the danger of explosions (one of which even killed the coxswain beside him), Curtis ordered his men to puck as many sailors and soldiers from the sea as they could. 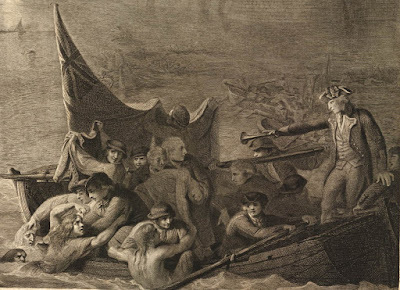 It was this courageous and merciful action that earned Curtis a knighthood and his place in many works of art, including this engraving by J.K. Kerwin. 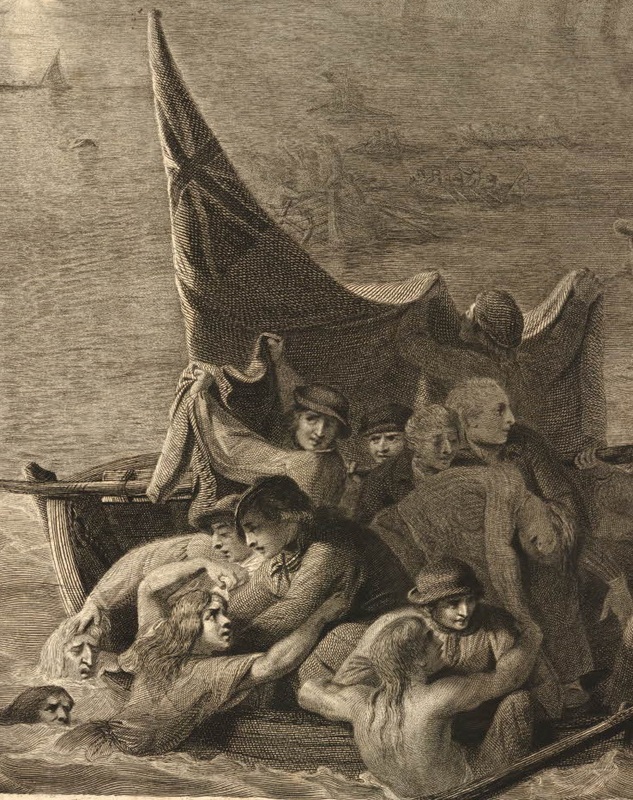 British sailors shield themselves from the blast by lifting their jackets and colors while their mates pluck the half naked foe from the sea. Though merciful, the sailors aren't too delicate with their helpless foe. One tar even grabs some poor exhausted chap by the hair. The saiors are in a mix of jackets and shirt sleeves. They wear round hats with short brims. There isn't a hint of a waistcoat among this lot. One sailor lifts his jacket for protection, and holds his neckcloth along with it. The jacket is single breasted with two button mariners' cuffs left open. Further aft, Curtis stands directing the sailors with a speaking trumpet. These men are also wearing round hats, though the oarsman wears a remarkably short brimmed cocked hat, what was perhaps a round hat pinned up. Both the oarsman and the coxswain (not yet killed by the blast) wear their jackets with open mariners' cuffs.